It’s not an oxymoron! Although San Francisco is ranked as the forth most expensive destination in the United States, there are endless ways to have a great time in this jewel of a city while staying on budget. 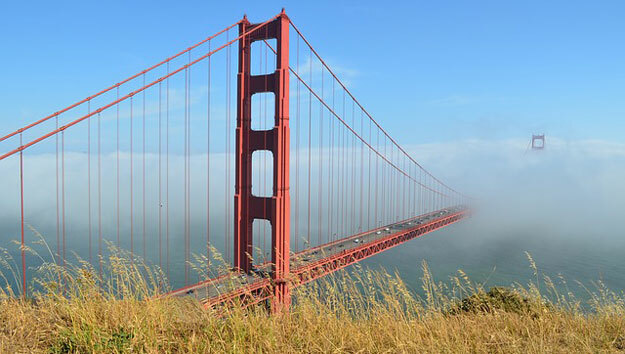 Read on for the can’t miss attractions and sites throughout San Francisco. With a little planning, they can all fit into your budget! Lodging eats up the biggest chunk and you should start there when planning a trip. If hotels are too pricey, consider the alternatives. You can rent a flat, house or apartment through a vacation rental company, which is very popular in San Francisco. You can find charming Victorian bed and breakfasts throughout the city’s neighborhoods. Try less expensive, smaller European-style hotels offering pleasant accommodation with basic amenities. Many of these are located around Union Square, Cow Hollow, and Fisherman’s Wharf. Next on the list is food. San Francisco is known for its superlative culinary offerings, but dining doesn’t have to wipe out a budget. The city’s multicultural neighborhoods all have small, storefront restaurants offering delicious meals at reasonable prices. There are great grab and go choices too including food trucks for tasty eats of all kinds and farmers markets where it’s easy to buy a hunk of artisan cheese, a loaf of fresh sourdough bread and ripe, flavorful regional fruit. Perhaps the most difficult decision will be scheduling what to see and do in this visually spectacular city chocked full of options. Make a daily plan prior to arrival so you know where to allocate your time and money. Balance your budget with a mix of great free stuff as well as visits to key attractions and museum that charge admission fees. Be sure to leave room in your plan, and budget, for those spontaneous finds as well! San Francisco is the ultimate walking city, a real bonus for the budget-minded. With good walking shoes and stamina for streets that go up, up, up and never seem to come down again, visitors can explore interesting neighborhoods, spectacular parks, and the bay. You may be staying in a neighborhood within walking distance of must see places. Should there be a point of interest that is too far for a walk, forget hailing a cab. Get there via public transportation by purchasing a multi-day Muni pass. Or, get two days of transportation around the city plus hop on hop off privileges at 20 great stops with Big Bus Tours. You’ll see so much from the open top deck of this double-decker bus and learn a lot from the audio narration, available in multiple languages. Enjoy the views, hop off at the stops of interest, explore the surrounding area, take in the sights, visit attractions, have a bite to eat, then hop back on the next available Big Bus that comes by. Spend time on along the Embarcadero and Fisherman’s Wharf. You can walk along and through it, taking in the sights and sounds on the piers of the active waterfront. You might want to spend some of your vacation budget here, especially if you have kids in tow. Get totally turned around in Magowan’s Infinite Mirror Maze. Musee Mechanique on Pier 43, is a super fun old-timey game and music arcade. Entrance is free, but bring along plenty of coins as those games will eat them up! Aquarium of the Bay with wonderful exhibits of area sea life, is a great attraction to incorporate into your trip. 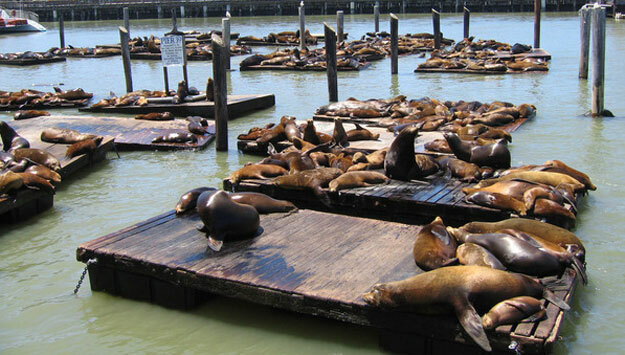 If all you want to see are California’s sea lions, do it for free at Pier 39. What seems like hundreds of them hang out on nearby piers, frolic around and make lots of barking noise. Pier 39, known as a tourist spot, has a lot to spend money on as there’s a lot going on and many bay tours and cruises leave from here. However, street performers put on shows for free and it’s a good place to find souvenirs. Don’t miss the Ferry Building at the end of Market Street. Go there for lunch and find some tasty choices in the food market lined with everything delicious. On select days, check out the Ferry Plaza Farmers Market in and around the Ferry Building. It’s one of the best in the business, and many vendors offer samples! This experience is a true thrill! To avoid being fogged in, it’s best to walk the famed landmark during May, June, September, or October. During other months, the fog rolls in in the morning and may burn off around noon. There are several ways to walk the iconic bridge depending on your walking stamina. Starting from the East Sidewalk, the only pedestrian access, head out to one of the bridge towers and then back. For those who want to venture a bit further, walk about 1.5 miles to the middle of the bridge and back. Real walkers will head out and walk the 3 miles to the Sausalito side and back! Check out Golden Gate Bridge Welcome Center for information and exhibits about the history, science and engineering of this magnificent bridge. Bridge Café is a great place to stop for grab and go locally sourced sandwiches, salads and more. 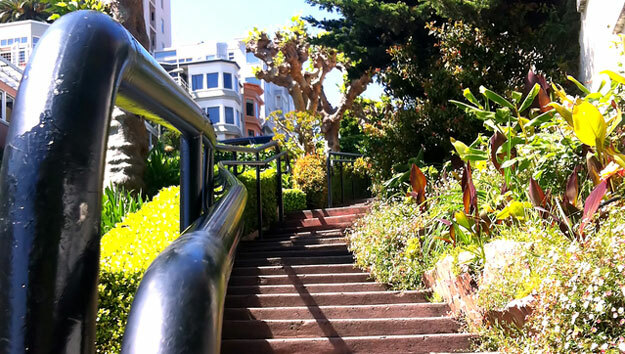 An off-the-beaten-path favorite, stairway walks access places most visitors miss. The views along the way are over-the-top spectacular and the close-up perspective of residential life in San Francisco is unmatched. Hundreds of stairways cross over the city’s 42 hills, and each stairway is different. They were built for access from one neighborhood to the other in areas too steep to go straight by other means. Many stairways are maintained by residences, which adds to their charm. Telegraph Hill, frequented by tourists has several stairways including the Filbert Steps that lead up to Coit Tower Stairs which lead to Coit Tower. Also in the area are Green Street Stairs, Vallejo Street Stairway, Greenwich Street and more. From the Ferry Building, ride historic Powell/Hyde cable car line through the Russian Hill neighborhood and on to the Cable Car Museum where the cars turn around. Fare is $6 one way and you’ll create fun memories along the way. It’s more than just a ride, it’s a unique San Francisco experience and the museum is really interesting. To go back to the Ferry Terminal, pick up the Powell-Mason line for a return trip. Or, ride the F-Market & Wharves vintage streetcar along the Embarcadero and all the way down to the Castro District. 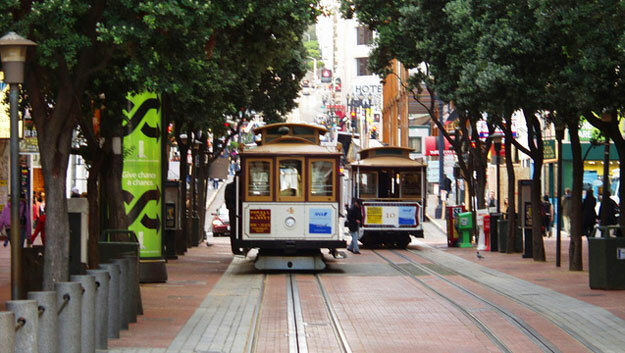 You can also take a cable car in one direction and an F-Line streetcar in the other between downtown and Fisherman’s Wharf. Here’s a tip: if you have a CityPASS, show your booklet and ride for free! CityPASS is a real deal. It’s a discounted package of admission tickets which includes transportation, a Bay cruise and general admission to three well-known attractions and museums. This booklet gives you unlimited transportation on all Muni trolleys, buses and historic cable cars for 7 consecutive days. Just show your booklet and hop on. Get out on the bay on the Blue & Gold Fleet’s 1-hour Bay Cruise where you go under magnificent Golden Gate Bridge, around Alcatraz Island and past Angel Island. Or, you can choose a thrill ride around the Bay instead on their RocketBoat. The package includes general admission to famed Academy of Sciences located in Golden Gate Park, where you’ll find four really cool experiences are rolled into one, an aquarium, rainforest, planetarium, and natural history museum, plus a living “green” roof! CityPASS also gives you a choice of aquariums to visit. You may choose Aquarium of the Bay on the Embarcadero, dedicated to the animals native to the area with an underwater glass tunnel and touch pools. Or, head down to Monterey Bay Aquarium, which is one of the world’s finest. Another choice to make will be general admission into the Exploratorium on Pier 13 on the Embarcadero, an amazing on-going interactive exploration of science, art and human perception, or the de Young Museum in Golden Gate Park, whose astounding collection of American art from the 17th through the 21st century is just the beginning. If you’re in the city for just a couple of days, check out a Go San Francisco One-Day Pass. It will give you general admission to as many attractions as you can fit in in one day from a list of 27 must-sees! To get the most out of this pass, plan ahead! Pick several in one area if you can, allowing for travel time between attractions. And be sure to allow time to fully enjoy each experience. The San Francisco Explorer Pass is a variety pack of deeply discounted admissions, appealing to a wide range of interests. It’s good for 30 days and allows you to choose four of San Francisco’s attractions, museums, and cruises. One of the 4 choices is a 1-day Muni Visitor Passport, which will get you around and experience a cable or streetcar ride at the same time. Another is Big Bus hop on/hop off sightseeing tour. Others include famed San Francisco attractions like Aquarium of the Bay, California Academy of Sciences, Exploratorium, de Young Museum, and Asian Art Museum. And if you’re looking for even more options, you can include Madame Tussauds, San Francisco Dungeon, AT&T Ball Park Tour, plus several bay cruise choices, bike rentals, and a ferry trip out to Angel Island and back! Walk through Dragon Gate to feel like you’ve been transported to another country. Chinatown is crowded and bustling with the smells of food everywhere. 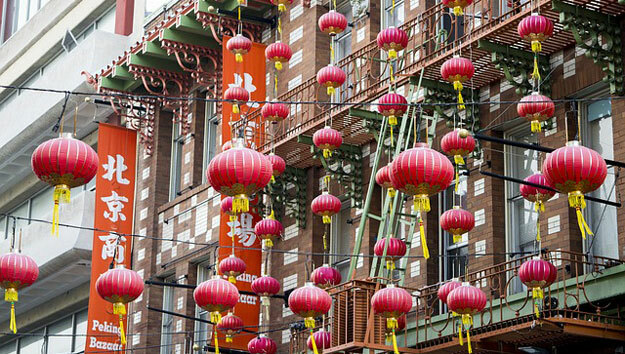 It’s a real neighborhood where the largest Asian population outside of China lives. Everywhere along the hilly 24 square block neighborhood there is color From signs and banners in Chinese calligraphy to storefront markets filled with a range of interesting fruits and vegetables. Grant Street is lined with inexpensive and touristy trinket shops to browse and bargain. Venture off Grant to explore the side streets and alleys for the full experience. Be on the lookout for temples and traditional herbal medicine shops that are tucked away. The wonderful aroma of baking cookies will draw you in to tiny Golden Gate Fortune Cookie Company on Ross Alley. Restaurants and bakeries are everywhere.